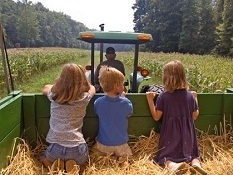 Wheeler Farm Wagon Ride Tickets HALF OFF! Today's Screamin Daily Deal is $3.50 to Visit the Children's Pumpkin Patch, Corn & Hay Maze & WAGON RIDE at Wheeler Farm!! Wahoo!! This is a $7 value! I remember doing the wagon ride as a kid. I'm excited to take my kids! :) Who doesn't like hay?? lol --Kids under 2 are FREE. If you're new to Screamin Daily Deals you will get a $5 credit! !